They are 12 points clear at the top of the premier division with four games to go and have a far superior goal difference over second-placed Horsham YMCA, who drew 1-1 with fourth-placed Newhaven last Saturday and are now the only side who can (just about) catch them. 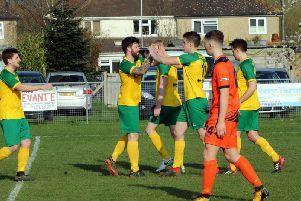 City look almost clinch to lift at home to Langney this weekend – that after beating Shoreham 5-1 last Saturday with a Scott Jones hat-trick. Gee said: “I thought it was a job well done (at Shoreham) by the squad of players. “We gave them the respect that any side deserves in our league. It wasn’t a foregone conclusion but we got off to a great start with that man Scott Jones. “He played a one-two off the bar from about 30 yards. He struck the ball, it hit the bar, came back and he knocked it back in, so a little bit of a bizarre goal. We then got a bit sloppy and gave them a bit of a lifeline. “We said at half-time: keep your focus, stay patient. Obviously Shoreham are scrapping for their lives at the bottom and to be fair, they moved the ball around quite nicely on an awkward pitch, but we trusted our players to come up with the goods. Gee has been impressed with how his players have performed so consistently this season. The latest win extended their unbeaten league run to 20 games. He added: “We know we’re nearly there but we do need another point to make it mathematically certain, and we’ll looking ahead to Langney at home and try to achieve that. “We’re not finding it that difficult with the group of players we have got. We keep reminding them week in week out, the minute they lose concentration and lose their focus, football has a nasty habit of not doing what you expect. The players are focussd, the squad is healthy.